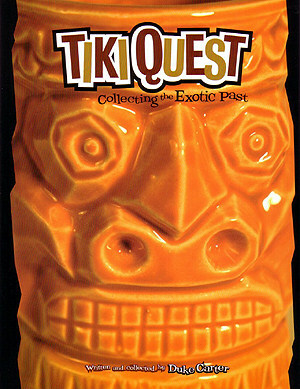 "Tiki Quest: Collecting the Exotic Past"
No bachelor pad is complete without a collection of tiki mugs. They are a common bond between hipsters, much like a stack of Martin Denny hi-fi records or a pile of Sir Knight! magazines. It's proof that you too have ventured into world of the exotic, drank your fill, and brought home the mug to prove it. It shows to the world that you are not afraid to enjoy libations with names such as Missionary's Downfall, Singapore Sling, and the grand-daddy of all exotic drinks the Mai Tai. Historically, tiki mugs were available as souvenirs at just about every tiki bar during the heyday of tiki culture in the 1950's and 60's. You drank the drink and (sometimes for a small fee) took home the mug. These mugs could be of many different designs and sometimes specific mugs were associated with specific drinks. Most of the time the mugs were stamped or imprinted with the name of the tiki bar they came from. They must have been more expensive than your standard bar glass, but well worth the cost. There's just something about drinking exotic drinks out of the ceramic tiki head that completes the whole tiki bar experience. A paper umbrella just doesn't look right hanging off the side of a highball glass. With a tiki mug, you get magic, mystery, and a tropical romance all rolled into one drink glass. Nowadays, tiki is everywhere. There's a growing retro movement where such mainstream stores such as Target have started putting tiki on just about everything. That's all well and good, but it's the classic tiki collectable that really interests Duke Carter. He, along with his wife Amy, have made collecting tiki a way of life. Their love of everything tiki shows. Their book Tiki Quest is an astounding catalogue of classic tiki mugs, statues, ash trays, matchbooks, and just about anything else that has sported a tiki or south seas image. The book is arranged by theme, whether it be Moai head mugs, hula girl drink bowls, or the precursor to tiki mugs the coconut mug. This makes it easy to compare whatever tiki mug you have to the classic design or one of the dozens of variations. It also makes for a great wish list for future collecting. The sheer vastness of the Duke's collection is staggering. Tiki Quest shows mug after glorious mug with detailed information about what company made it and where is was originally found. If you think you knew everything about tiki culture, think again. This is hands down the best tiki-related book to come out this year.